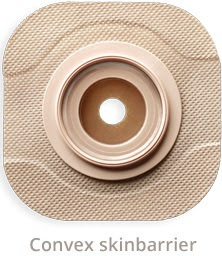 The Parthenon Company Blog - Specialists in Wound and Ostomy Supplies: CeraPlus Ostomy Skin Barriers Newest Product From Hollister! CeraPlus Ostomy Skin Barriers Newest Product From Hollister! A new skin barrier was recently introduced by Hollister called CeraPlus. Named after ceramide, a naturally occuring lipid in the skin that preserves moisture and fights dryness. This line of barriers is to be used with the New Image two-piece ostomy appliance line. Ceramide is a natural component of skin made up of waxy lipid molecules. Ceramide joins cells of the epidermis to create a waterproof barrier to prevent moisture loss. This will be a great addition to options available to ostomates especially those fighting to preserve the health of their peristomal skin. The CeraPlus skin barrier will be available in flat and convex barriers able to be pre-cut or cut to fit. Hollister Skin Barrier CeraPlus is infused with ceramide to provide optimal moisture protection!